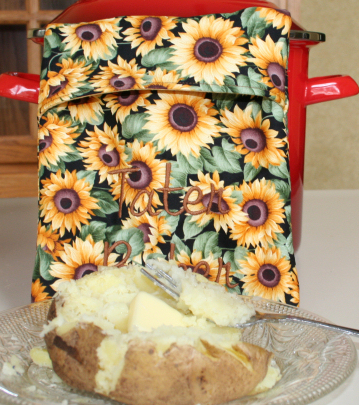 For several years I have seen and heard about bags made to bake potatoes in the microwave. They are touted to produce fluffy, moist baked potatoes. So when I had all the cotton stuff out to make the tortilla warmer I decided to make one and see. Hey, what do you know, it works pretty well. It was the best microwave cooked potato that I had ever had. So, although this is not a new concept (LaRue shared one a couple of years ago) I will share how I made mine. 1 rectangle 100% cotton batting 9'X21"
1. Determine embroidery placement. I layered the rectangles outside face up, then inside face down, then batting. 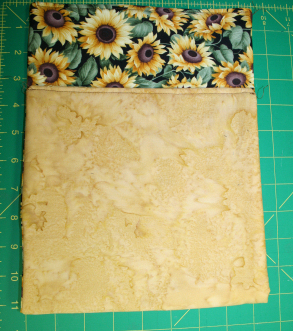 Then I lined it up on my cutting mat and folded the bottom end of all layers up leaving 31/2" of batting showing at the top. 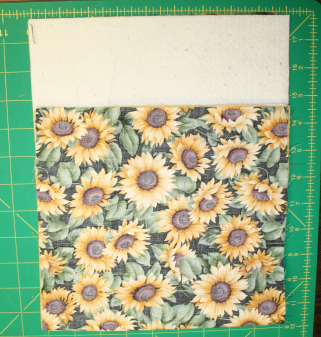 Next I folded the outside layer down and measured 1" from the fold. 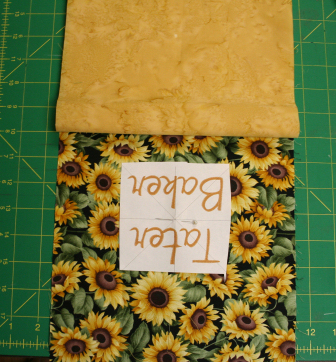 This is where I placed the bottom of my design template centering it widthwise and placing it UPSIDE DOWN. 2. Pull the layers apart. Hoop the tear away stabilizer and fabric centering the template. Slide the hoop onto the machine and center the needle over the center point of the template. Remove the template and embroider the design. Remove from the hoop and remove all the stabilizer. 3. Layer the rectangles, outside face up, inside face down, batting. Sew 1/4" from the edge all the way around leaving a 3" opening to turn in one end. Reach between the two fabric rectangles and turn right side out. The batting should now be inside and the fabrics right side out. Press. 4. 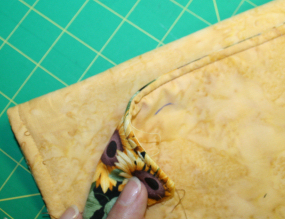 Top stitch 1/4" from edge across both short ends. Place the rectangle on a table with outside fabric facing up. 5. 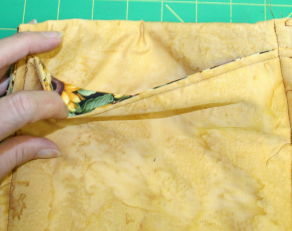 Fold the embroidered end up leaving 3 1/2" of the outside fabric showing at the top. 6. Flip 3" of the top over and tuck under. 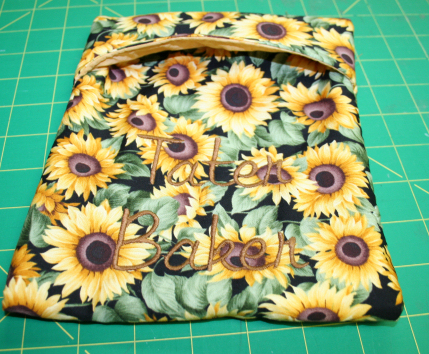 Sew 1/2" from edge down both sides to make a bag. 7. 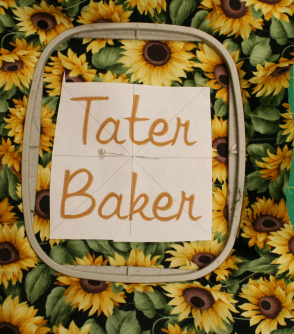 Turn right side out and you have a tater baker that will hold one large or two medium potatoes. Microwave according to your microwave's instructions. Remember that you never want to leave a microwave unattended while in use. Wash and dry one or two potatoes. Do NOT poke potatoes with a fork. Place potatoes in the Tater Bag. Microwave 6-9 min for two. Varies so use your Microwave's directions. These potatoes will be quite fluffy! Let the bag cool before using again. If you missed the tortilla warmer you can see it here. These snack bags also make good small gifts filled with whatever you choose. They are really cute for Christmas with the gingerbread man I used in this blog. Here is a picture of one I did a couple of Christmases ago. I am going to try one today. sounds great.